Queen Rotunda is a gluttonous, extremely large and somewhat self-delusional woman and the ruler of the kingdom of Rotunda Land. 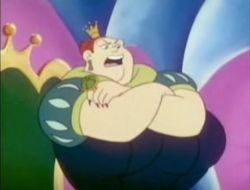 Queen Rotunda is a parody of the Queen of Hearts from Alice in Wonderland and takes the place of King Koopa for the entire episode. In The Super Mario Bros. Super Show! episode "Love 'Em and Leave 'Em", Queen Rotunda, desperate to gain the affection of an old friend, Prince Pompadour, has a hag named Hildy brew her a Passion Potion. Her plan is to make Prince Pompadour drink this potion and make herself the first thing Prince Pompadour sees after that, which will cause Prince Pompadour to fall madly in love with her. It is shortly after Hildy completes her Passion Potion that Queen Rotunda is informed by one of her Beezo minions that thieves have been caught stealing her royal hot peppers. Outraged by the mere thought of someone stealing food from her, Queen Rotunda goes to her throne room to see these thieves, taking some of Hildy's Passion Potion with her. Arriving at her throne room, Queen Rotunda confronts her prisoners, Mario, Luigi, Toad and Princess Toadstool. Before deciding what should be done with them, she decides to sample some of the cake she had her chef prepare for her impending wedding with Prince Pompadour, only to call it disgusting. After kicking the cart containing her cake away, Queen Rotunda sentences Mario, Luigi, Toad and Princess Toadstool to be beheaded for stealing from her. Before Queen Rotunda's sentencing can be carried out, Mario manages to convince her to allow himself to make her some "hot pepper pistachio ice cream" as the dessert for her wedding. Intrigued by the idea of tasting a new food, Queen Rotunda allows Mario's gang to live, at least until after the hot pepper pistachio ice cream is made. Mario creates the hot pepper pistachio ice cream and Queen Rotunda tries it, but is quickly overcome by the sheer hot flavor of it. Desperate for something to stop the burning in her mouth, she frantically hops around her throne room, asking for water. Mario, wanting to help Queen Rotunda, grabs the nearby bottle of Passion Potion on the queen's throne and pours it into her mouth. Mario is the first thing Queen Rotunda sees after ingesting the Passion Potion, meaning she has fallen madly in love with him. Following a short chase after a confused Mario, the queen captures him by wrapping him in carpet and dragging him away to plan their wedding, also telling her Beezo guards to take Luigi, Toad and Princess Toadstool to her castle dungeons. In preparation for their impending wedding, Queen Rotunda forces Mario to exercise vigorously, wanting him to become thinner for the wedding, as she simply continues to eat. Eventually, Luigi, Toad and Princess Toadstool escape the dungeon and Queen Rotunda, upon learning this, sends her Beezo guards to find and capture them as she begins to set up her wedding. As her Beezo minions search for the fugitives, Queen Rotunda finally begins her wedding to the hesitant Mario. It is only when he is being dragged down the aisle by the queen that Mario notices his friends descending from a nearby tower. Seeing that Luigi has a flask of Passion Potion in his hand, Mario distracts Queen Rotunda by pretending to tie his shoe as Luigi pours his Passion Potion into two glasses on a table directly below him. Mario grabs them and proposes a toast to Queen Rotunda and the nearby Prince Pompadour, giving the two the glasses of Passion Potion, which they drink. Ingesting the potion again, Queen Rotunda instantly falls in love with Prince Pompadour and vice-versa. After being proposed to by Prince Pompadour, Queen Rotunda accepts his offer of marriage and the two embrace. This page was last edited on January 28, 2019, at 03:16.